This is a very late battle review, for which I apologise. Mark of One-Sided Wargames fame has already posted a very fair review here so this is by way of addition and comment. 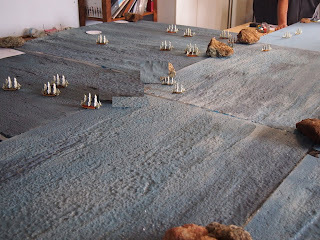 I should also very much like to thank all my comrades in the ANF for once again agreeing to indulge my fantasy and participate in a Napoleonic Naval action. I was again allowed to choose the scenario: with the increasing size of my Sails of Glory fleet, the assistance of additional ships from ANF comrades, and a little confidence gleaned from our last action San Domingo that we could accomplish a full battle in a day, I now felt inclined to try out a medium-sized action to test the next set of rules, Form Line of Battle by David Manley, a very popular set of Napoleonic Naval Rules which has gone through several editions and is used by many wargames clubs, but of which more later. The action I chose was Cornwallis' Retreat, which, was, as Wiki tells us, 'a naval engagement during the French Revolutionary Wars in which a British Royal Navy battle squadron of five ships of the line and two frigates was attacked by a French Navy battlefleet of 12 ships of the line and 11 frigates in the waters off the west coast of Brittany on 16–17 June 1795'. A full account can be found here. 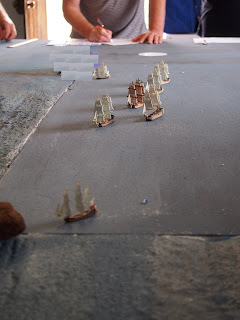 The main issue for me as the scenario designer was to ensure that an action took place at all, that the British were not allowed to escape easily, but equally, to ensure that the French did not position themselves perfectly, and catch the British between two fires. It was therefore absolutely fascinating to me that the French Vice-Admiral Villaret de Joyeuse, ably played by James, followed the historical deployment extremely closely. His subordinate, Rear-Admiral Kerguelen, took as critical a view of the deployment as his historical counterpart, which was also immensely pleasing from a scenario point of view. 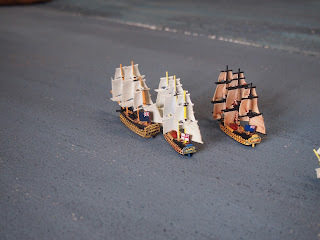 Three lines of ships with the frigates deployed around them. 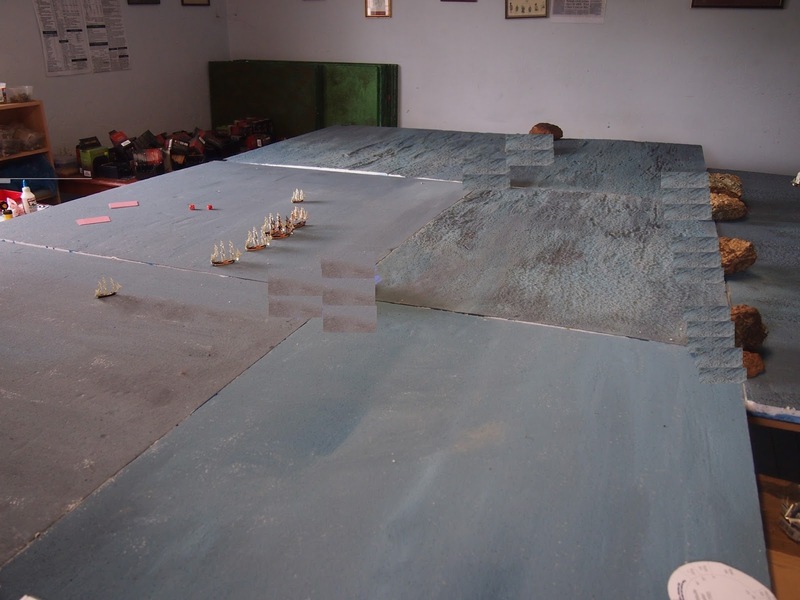 Apologies for the blocks in the pictures: my efforts to re-design our sea foundered rather with incorrect use of paints causing undue flex (as well as some quite spectacular wave formations, and drastic measures were required to hold the sea in place). At least we had some realistically grey, rough and miserable looking Atlantic weather as a result. The French fleet came on in not a little confusion, as randomisation under full sail cut in. 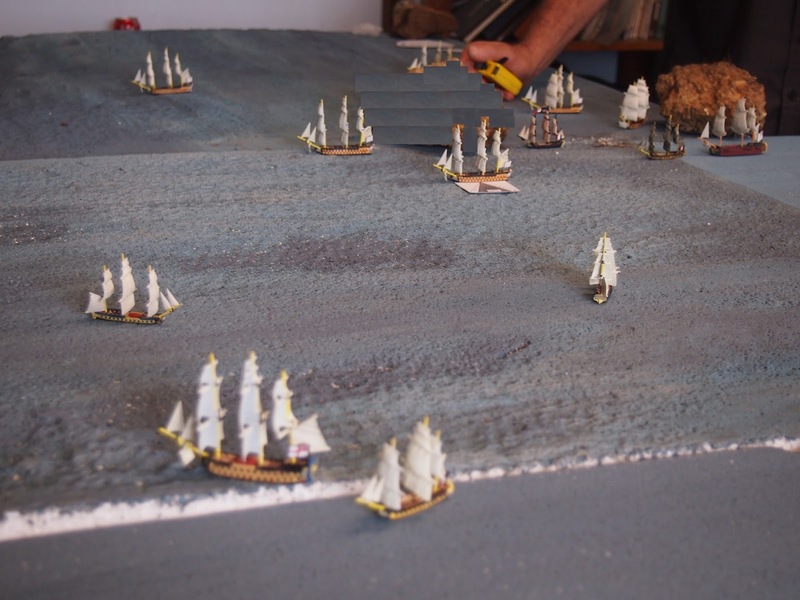 On the British side, determination was the order of the day, as Admiral Cornwallis decided to turn and fight, a resolution which was much aided, I am sure, by the slow sailing of two of his ships, with which the rules coped admirably. 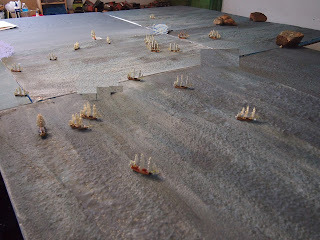 We had sufficient players to allow Stephen to take over two ships of the line as Captain Charles FitzGerald whilst I played the commander of the British frigates, intent on replicating their actual deception, if I could. No doubt, then, that there would be an action. I may have got the wind direction slightly wrong, but my decision was to keep it as it was. On reflection I should certainly have allowed ships to lower their sails, which would have made a huge difference - mea culpa. The British line was challenging to maintain, given the different sailing capabilities of the ships. 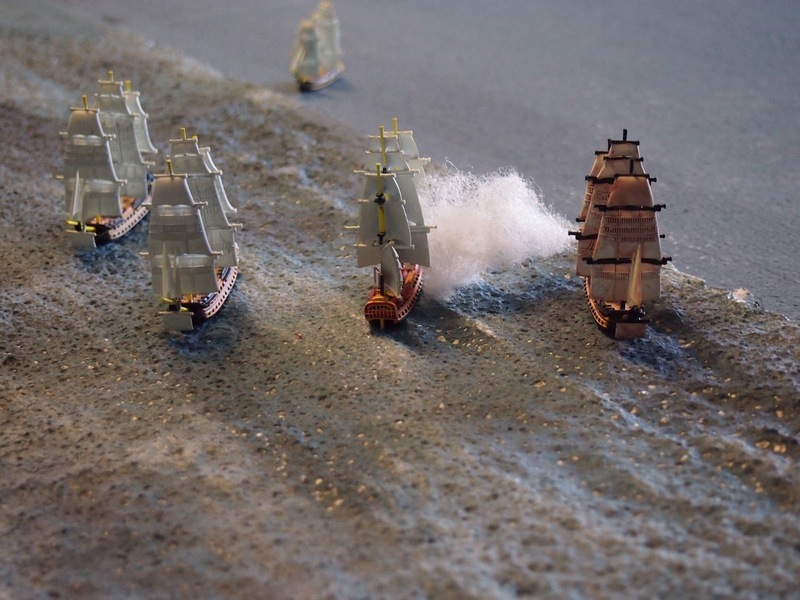 Early shots at long range from the British line of battle had a devastating effect, with the 'Alexandre' forced out of line, on fire and eventually sinking. 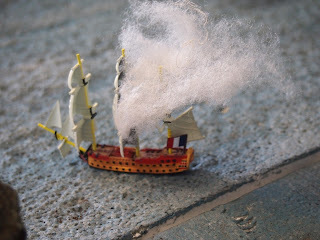 It was a huge initial blow to the French force and from a morale point of view, I do not think they entirely recovered. In fairness, the rules were new to everyone and the extreme unlikelihood of this event being repeated was not initially clear - I too was fairly astounded. 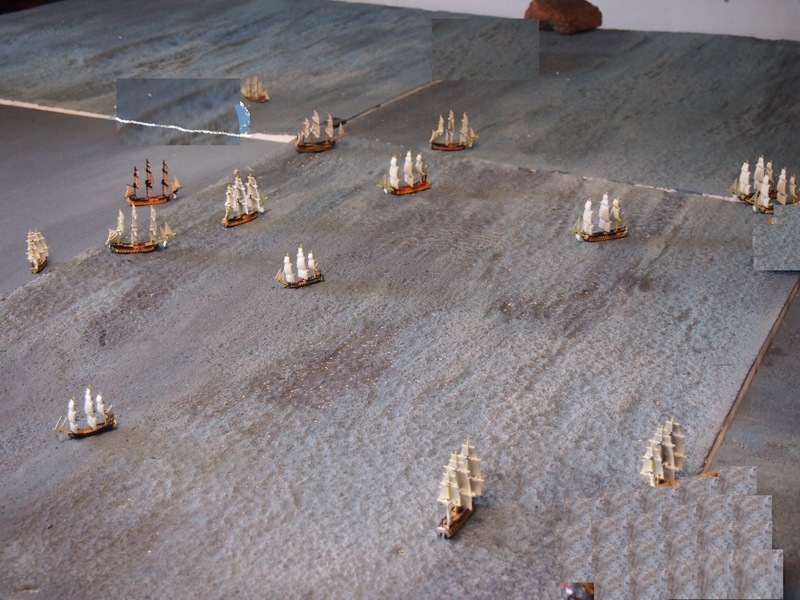 As the line closed, frigates took centre stage. 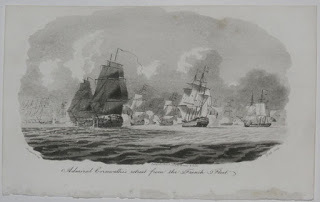 As a result of their bold handling, the British commander ordered fire on frigates from his line, with the inevitable result that the French retailiated, the British ending up the losers as a result of this exchange. One bold French frigate even ended up raking - somewhat ineffectually - the British line, ending up heavily damaged but escaping. 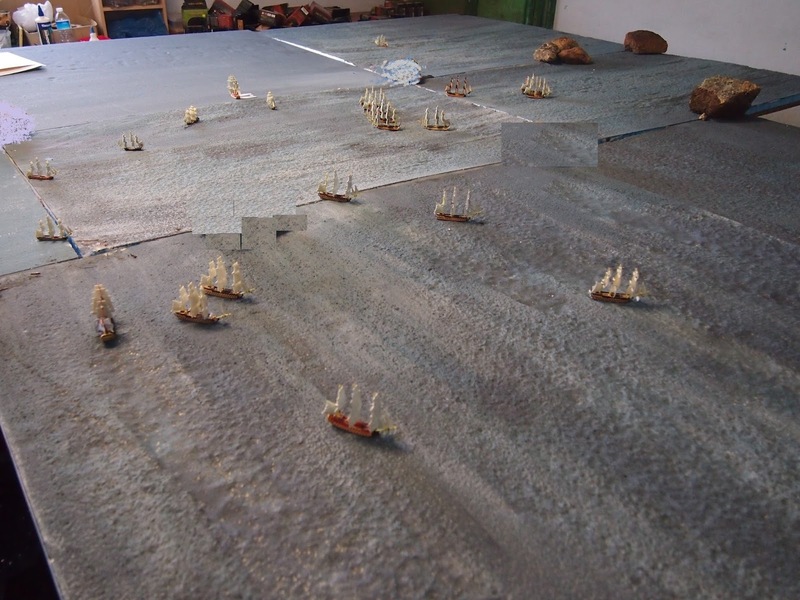 The French commander continued to be rightly worried about the Channel Fleet making an appearance - that will have to wait, however - although in practice it was the wind direction that in his view prevented him from pressing the action. Not too dissimilar a view, in fact, given the difference in perspective. It was exceptionally depressing that other commitments forced me to leave at this point: never again! Quite understandably my comrades continued for another move and then called it a day. The net result though - one French ship of the line lost, one British frigate also lost, and some moderate damage all round otherwise - was highly realistic, and more than answered the niggling doubt I had harboured that Napoleonic naval rules would lead to mutual devastation. The action had indeed proved possible to fight within a day, as I had hoped. There were however some very conflicting impressions regarding the rules. General sentiment appeared to lie in favour of Signal Close Action by comparison to Form Line of Battle, with the view being expressed that the element of chance was simply too great, the loss of the 'Alexandre' being cited to that effect, and the wind rules were too inflexible. The former was down to chance - such a thing could conceivably happen, although the chance was very slight - the latter I believe was my misinterpretation of certain aspects of the rules, especially the ability to down sails (detachable masts replaceable with downed sails would indeed have been a bonus for Sails of Glory ships). By contrast I was myself left with a warm and fuzzy feeling towards Form Line of Battle which I did not feel for Signal Close Action, similar to this reviewer from many years ago link, but this may just have been the experience of fighting a second battle or a personal sympathy with the kind of game mechanics David Manley designs. More experience evidently required, and I still have lots of work to do in scenario design. There are also a few more rule sets to try out yet, however: we are deliberating between Heart of Oak, Blood, Bilge and Iron Balls, or Close Action. This action was ambitious enough: next time though I am dreaming of something even bigger. Come on Ares, let's have a few more ship types to help us! Thanks for the report/review. I have been considering trying FLoB for a while. I see he PDF is omn sale until Jan 4th; I may well pick up a copy. I've played Signal Close Action twice - the rules work, but very, very chartilicious, doing the ship sheets takes forever, and the collision rules still make my head spin. Good to see this report, Julian. Looking forward to trying out more rules, which reminds me I have at least two, not including Galleys and Galleons. 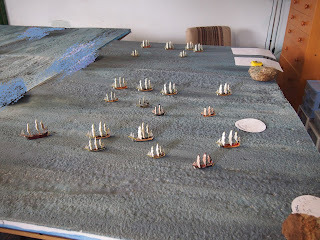 SPIs Frigate, Line of Battle (which has an interesting campaign system) and Sea Battles in Miniature. Just need time.